The University of Nebraska-Lincoln was the first school west of the Mississippi River to formally establish a graduate school. 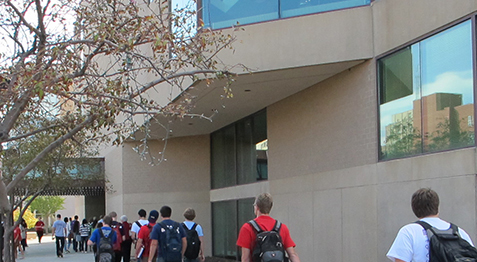 Doctoral degrees in economics have been awarded at Nebraska for over 100 years. The department currently has 19 actively publishing faculty members. Our Ph.D. program is notable for its blend of advanced economic theory and applied policy analysis. The focus of the program is applied microeconomics though we offer a number of fields of concentration. Five research centers, Bureau of Business Research, Central Plains Research Data Center, National Center for Research in Economic Education, Nebraska Council on Economic Education, and Lincoln Center for Economic Education provide support for graduate students. As a relatively small program we can provide close association between students and professors. Students may be provided with office space in the building. Teaching assistants are given full responsibility as instructors for undergraduate classes after the first year. Most research assistants work on research projects at one of our centers. All students are assigned to work directly with professors on research. The department awards three to four assistantships to new students each year. These appointments are either teaching or research assistantships and provide a full tuition waiver, stipend for up to four years and heavily subsidized medical insurance. These assistantships are often supplemented with Othmer, Chancellor’s and Ogle Fellowships. The financial packages are highly competitive with our peer institutions. Read more about our supporters who help make us great. Approximately 90% of graduates are employed in academic jobs, with the rest working in research and consulting for business and governmental agencies. See our list of all placements since 2000. 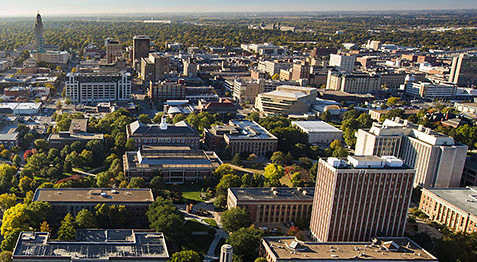 The University of Nebraska-Lincoln is located in Lincoln Nebraska, a thriving city of 300,000 with low crime and low unemployment that is consistently ranked among the top cities in America for quality of life. A core program consisting of courses in microeconomic theory, macroeconomic theory, and a full sequence of econometrics courses is required of all candidates. In addition to the core program, all candidates focus on a major field of concentration. The degree requires not less than 48 hours of course work, successful completion of qualifying exams in economic theory, a third year research paper, and a doctoral dissertation on an original topic. Please see our Graduate Handbook for a full description of the program. The core courses are provided to assure that students receive solid training in economic theory and econometrics. Students demonstrate mastery of theory by passing the Qualifying Examination in Advanced Economic Theory and mastery of econometrics by earning at least a B in each course. An optional second field may be taken. The requirement is six hours of course work at the Ph.D. level. Students may include electives within economics or cognate areas. Students must demonstrate ability to conduct research by writing an original dissertation and defending that dissertation in an oral examination. At least 12 hours and up to 42 credit hours may be used for this purpose. The Master of Arts degree in Economics is designed to prepare students for a Ph.D. program either at Nebraska or at other institutions. Well-prepared students should apply directly to the Doctoral program. Masters students are expected to take the same core theory sequence as doctoral students. The MA degree requires 36 credit hours. Students taking 12 hours each semester can finish in 3 semesters. Students taking 9 hours per semester (the more typical load) finish in 4 semesters. After successfully completing the core theory sequence and passing the PhD. qualifying examination students may apply to the PhD. program. Coursework and examinations taken in the Nebraska MA program will transfer directly to the PhD program. Students interested in an applied degree are encouraged to consider the Masters of Science program offered in the Department of Agricultural Economics. Designed to help teachers enhance their knowledge of basic economics concepts and demonstrate how economics can be taught in the K-12 classroom. 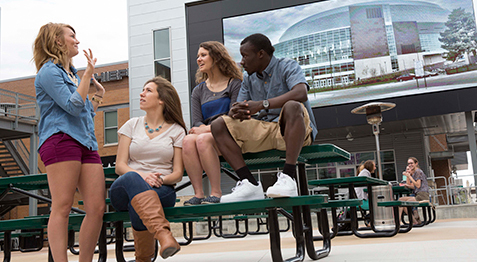 See Master of Education Brochure. The department does not employ a rigid formula for admission, but we expect excellent undergraduate (or graduate if applicable) records in economics, mathematics and statistics. We expect excellent GRE scores, TOEFL scores (when applicable) and strong letters of recommendation. At the minimum, Ph.D. students are expected to have intermediate level training in economics (both macroeconomics and microeconomics) in their backgrounds. In addition, Ph.D. students are expected to have strong mathematical backgrounds including at least two semesters of calculus, a course in linear (matrix) algebra, and a course in mathematical statistics. Differential equations and Math Analysis are also recommended Any course deficiencies must be removed prior to the first semester of enrollment. Apply online at the Office of Graduate Studies and submit the application fee. The next day you will receive instructions for the GAMES application system. Please note: All application materials (except transcripts and finance resource certification) must be submitted electronically. Do not send paper recommendation forms. Please submit a Statement of Purpose outlining goals and objectives for studying economics at the graduate level. You should register to take the GRE (standard test) and have the results forwarded to Nebraska (use institution code 6877). You should also submit your scores through GAMES. International students should include a TOEFL score (minimum score of 550 written, 213 computer based or 80 iBT (use institution code 6877)) or 6.5 IELTS. Guidelines for international students can be found at http://www.unl.edu/gradstudies/prospective/international. International applicants will be required to submit evidence of spoken English ability to be considered for teaching assistantships. Due to delays in receiving letters of recommendations and transcripts, candidates are advised to begin the application process well before the stated deadlines. Applications are evaluated as received. Completed applications received after the deadline may be considered; however, a timely decision is not guaranteed. *Because coursework begins in the fall semester, beginning the program in the spring semester is problematic, Spring Admissions are considered only under unusual circumstances and funding is typically not available. The department awards three to four assistantships to new students each year. These appointments are either teaching or research assistantships and carry financial packages that are highly competitive with those offered by other graduate institutions. Assistantships provide a full tuition waiver, stipend for up to four years and heavily subsidized medical insurance. These assistantships may be supplemented with Othmer, Chancellor’s and Ogle Fellowships. Current information on tuition and costs is available on the Nebraska Graduate Studies website. All applicants are considered for assistantships. No separate application for financial aid is required. Preference in financial assistance awards is given to Ph.D. applicants, but M.A. applicants are considered as well. Typically, our incoming Ph.D. students selected for assistantships have verbal scores above the 70th percentile, quantitative scores above the 80th percentile, and a writing score of at least 4. These scores should be viewed as guidelines, and are neither necessary nor sufficient for an offer of financial aid. We evaluate the entire application. Assistantship decisions for the fall semester are typically made in February and March. Recipients are notified on or about April 1. Duties of first-year recipients of assistantships will likely include assisting professors with their instructional duties or working as research assistants. In addition to assistantships, the department traditionally gives two competitive awards to Ph.D. students. The McConnell Dissertation Fellowship provides full support for two semesters to a student who is in residence and in the completion year of the dissertation. The Bingham Teaching Fellowships are one-year supplemental stipends and are given in recognition of outstanding teaching abilities and performance. We kindly ask you not contact individual faculty members or the chair of the department. After reviewing the website and our FAQ page, direct all questions to our director of economics graduate programs, Professor Matthew J. Cushing listed below.